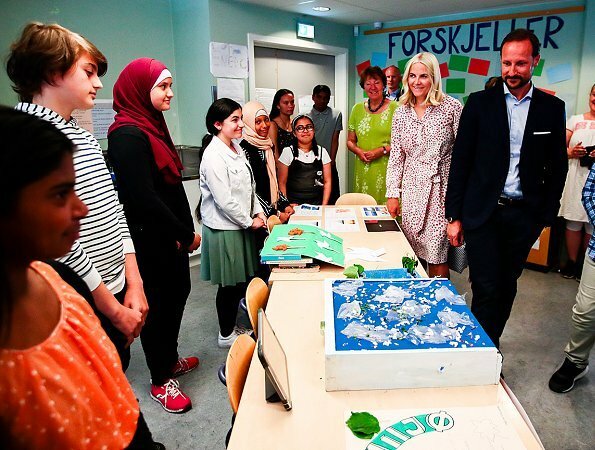 On May 23, 2018, Wednesday, Crown Prince Haakon and Crown Princess Mette-Marit of Norway visited Linderud School in Oslo. A presentation of "Forskjeller" project which is a work of the students was made to the Crown Prince and the Crown Princess at the school. That project deals with the differences in the world. Linderud School has more than 600 students and 100 employees including activity schools and urban groups for students with autism and mental retardation. Beuatiful dress, that fits MM well. Love it. Only a slight remark, I would have opened one more button on the blouse top. I think she opened one extra button as the day proceeded (compare the first photos (outdoors) to the later ones (indoors). It looks good on her, she has great skin, and I don´t understand why she usually looks the "buttoned-up" with most of her outfits featuring very high, usually t-shirt-like necklines, or higher. 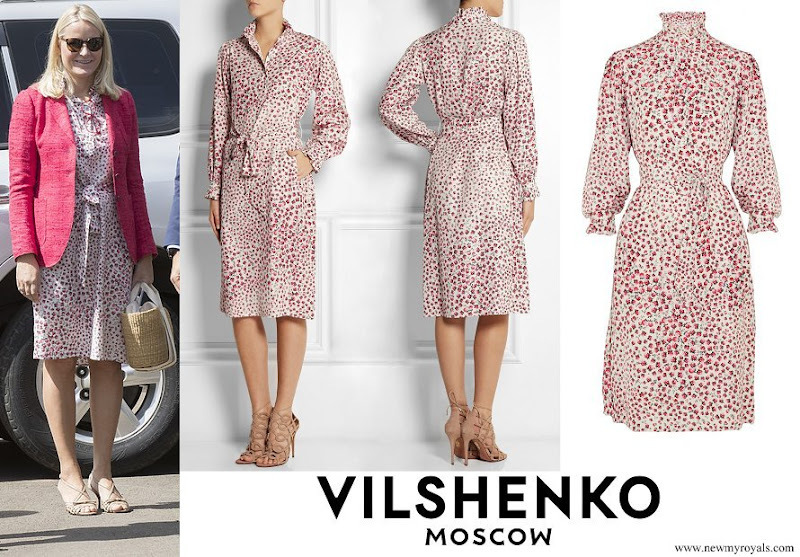 This outfit here is already quite the departure from her usual, and I like it, allows the dress to breathe and goes well with its overall light and airy style. A pretty summery dress on MM that suits the occasion. Also like her sandals. A warning to other posters: look away now from Haakon's shoes. Haakon and his shoes drive me nuts! I also think his trousers could be better (proper length). Perhaps all of this is because the men I grew up with, but from a CP I expect better. I agree that Mette-Marit's look is lovely. What I can't understand is why Prince Haakon doesn't have some comfortable shoes made-to-fit in black leather, too. He obviously loves those ugly brown shoes because he wears them almost all of the time. Or he could wear some tan or brown pants instead. I bet his mother just shakes her head when she sees him. Thank you for the warning, Pine! You are right! The shoes look scruffy, I agree. And I think it´s the combination with the blue suit that makes them look especially bad, both because of clashing colours and clashing styles. The brown shoes would look ok-ish with beige chinos, or jeans. But with a semi-formal suit, and a dark-blue one at that, they look really bad. Mette-Marit est pour moi la plus jolie et la plus naturelle des princesses. Completement en accord avec vous, Fardouche. Elle est très belle et la plus naturelle que toutes les autres. I totally agree. She looks lovely in this light summery dress, and her personality and smile (and his) outshines any minor sartorial misses. They are such a good looking, grounded couple together. Smiling and beautiful. She is a natural beauty.I like this summer dress. It fits her well. Pretty dress that definitely needed the pink jacket.